Gerolstein goes racing ... without me! My Berlin season is ON! In my half a century of musical life, I have really not been very eclectic. I became a ‘singing’ man in my teens, and my career has been entirely spent around vocal music of all kinds. Singing it and then (and now) writing about it. Four years ago, I came to Berlin and I met Paul Hankinson, pianist and mega-musician. I hauled him off to the opera and musicals, and in return he led me, like Dante, into the world of instrumental music and concerts. I didn’t know quite nothing (brother John used to play fiddle and chamber music and I was a fair pianist) but to all intents and purposes I was a novice. And a novice with opinions. Often uninformed … I like this composer, don’t like that one. Poppycock. Well, the experiment has been a rousing success. We have attended some splendid concerts (some with just a leetle vocal music) in the past couple of seasons, but last night was an acid test. 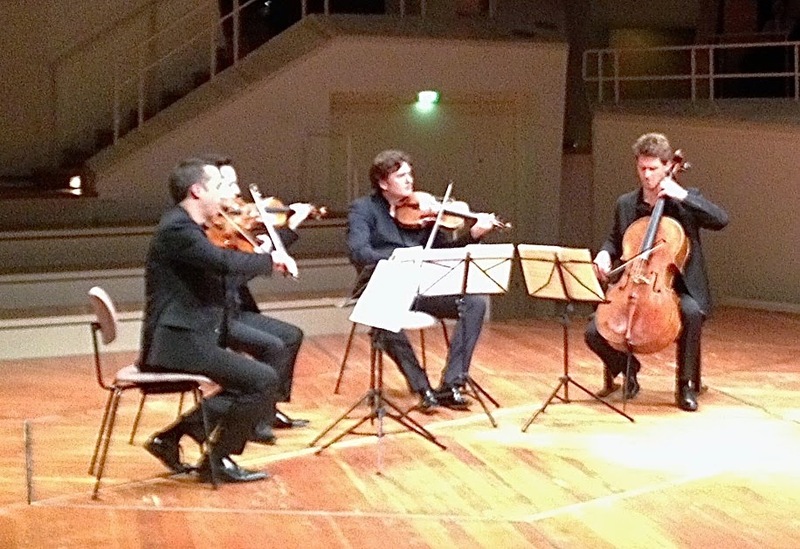 A whole evening – yes, a whole evening -- of a string quartet. For the first time ever. Mozart, Bartok, Schumann. Will I get bored in the tenth movement? Start coughing in the quiet bits? 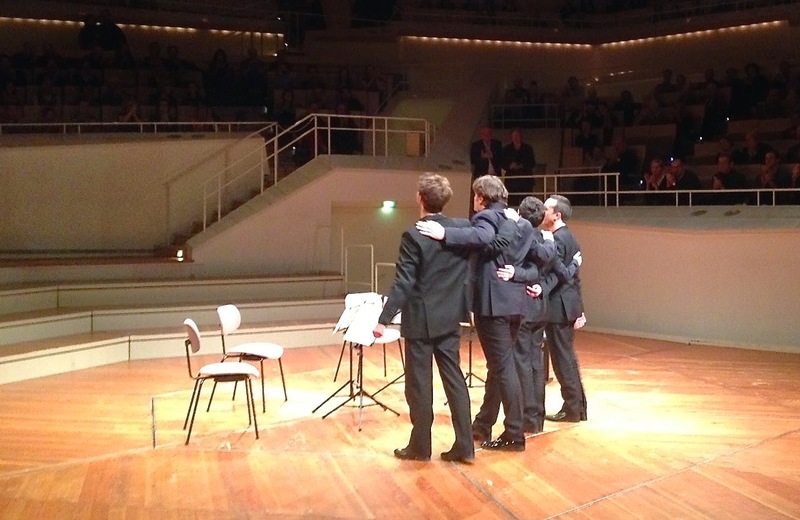 The Mozart was a joy. The team played so tenderly. The instruments were so warm. Never showy-loud or strident. So much wonderful, gentle playing. The second movement was glorious, perhaps my favourite section of the whole evening. I got a shock when the Bartok started. Ouch! The dramatic, super-vigorous opening movement left me rather stranded and lost. It was so different to what I’d just heard. But I picked up my breath in the second part, and the third movement simply blew me away. A rather camp pizzicato portion led to a finale which rather returned to the style of the opening and left me thinking, ‘this piece needs more than one hearing’. And then came the Schumann. Well, all I can say is my mind didn’t wander for an instant throughout the whole lovely piece. And it gave me my nirvana of the night in its third movement when the viola sang forth with ... well, Paul says it went A.. B.. C A... G G .. or did he say A B C A G F# E E D# ..
And then it was over. Well, not quite. The boys gave, as an encore, a sweet arrangement of the old Johnny Mathis ‘Misty’ (which by the way, fellers, has nothing to do with Broadway) to send us all – even the man who kept yelling ‘bravi’ punctiliously in my ear – all away in the relaxed and enjoyful mood in which they’d kept us all night. So, now I know. Chamber music and string quartets don’t have to be four-square, super-classical, mechanical, dull … it’s all in the way you play it. I’ll go back to this friendly, warm, tender group any day. I’m a convert. Lead me to the next one!